If a microelectrode is inserted into a cell, another electrode is placed into the interstitial fluid and the two electrodes are connected to a voltmeter, the inside of the cell will show a negative deflection of about -70mV (-50 to -90) with respect to outside.T his potential called the resting membrane potential and its value depends on the type of tissue. .
1- The resting cell membrane is 10-100 time more permeable to K+ than Na+. 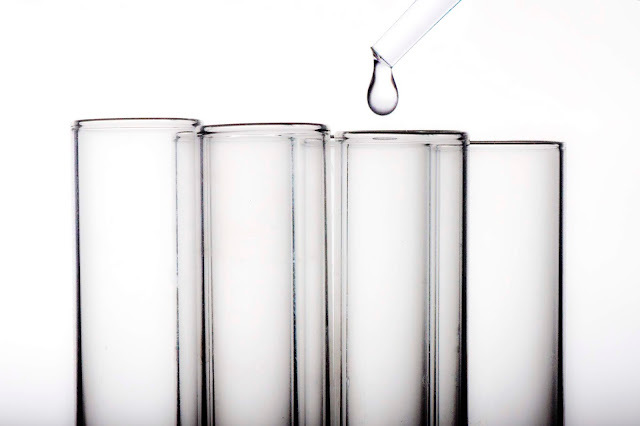 K+ tends to leak out down its concentration gradient, carrying positive charge with it and is unable to carry CL -with it, because CL – has high concentration outside. This tends to make the cell interior more negative . 2- The non diffusible anion (protein, sulphate and phosphate ions) cannot leave the cell. According to the Donnan,s effect there is a slight excess of cations outside and a slight excess of anions inside. 3- Avery small amount of Na+ diffuse into the cell down concentration gradient because cell membrane is only slightly permeable to Na+. If K+ continued to leak to outside and Na+ to inside, equilibrium would be reached and there would be no potential difference between the two sides of membrane. This does not happen because of the Na+- K+ pump..
* There is evidence that CL – does not contribute to the value of RMP, also because PK+ is almost 100 times P Na+, the RMP depends primarily on K+ with very little contribution from Na+. * Increasing the Extra cellular K+ concentration causes reduction in RMP, whereas changing the Extracellular Na+ concentration dose not significantly affect the RMP. * There is evidence that CL – does not contribute to the value of RMP, also because PK+ is almost 100 times P Na+, the RMP depends primarily on K+ with very little contribution from Na+. Increasing the EC K+ con causes reduction in RMP, whereas changing the EC Na+ con dose not significantly affect the RMP. 1- Transmission of impulses along nerve fibers. 2- Release of neurotransmitters in synapses. 3- Activation or inhibition of glandular secretion. -When the stimulus is applied, the stimulus artifact, a brief irregular deflection of the baseline occurs, is followed by an isopotential interval- latent period, that end with the start of the action potential. -When a cell membrane is stimulated by a physical or a chemical stimulus, (A stimulus which is just strong enough to move the RMP from a resting value -70mV to the level -55 mV that leads to the production of AP is called a threshold stimulus). 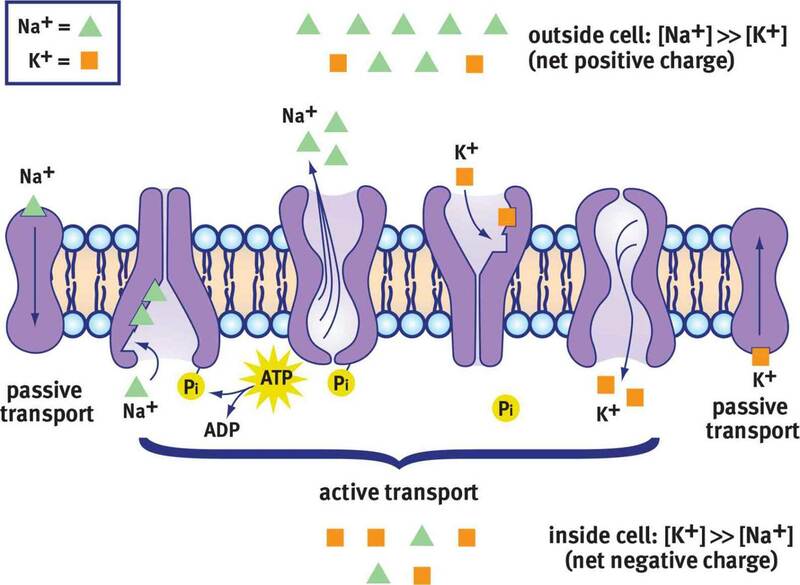 -the cell membrane permeability to Na+ is increased, Na+ channels open and Na+ rush to the cell, causing inside of the membrane positive with respect to outside, this called depolarization, the membrane potential becomes reversed and reached +35m V.
-Towards the end of depolarization Na+ permeability deceases K+ permeability increases abruptly and K+ ions leave the cell down their concentration gradient, causing the inside to return to negative potential, this called repolarization and the membrane potential is brought back to -70m V.
-The duration of AP in skeletal muscle and nerves is about 1-5ms . -When repolarization is about 70% completed, the rate of repolarization decreases and the approaches the resting level more slowly. 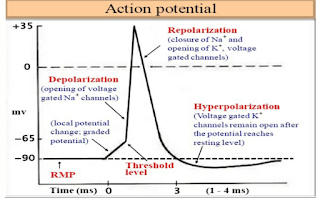 -after reaching the previous resting level, the tracing overshoots slightly in the hyperpolarization direction to form the small but prolonged after- hyperpolarization, is about 1-2mV ,it lasts about 40ms. The slow return of the K+ channels to the closed state explains the after- hyperpolarization. -Na+- K+ pump regains its RMP and is ready for another action potential. 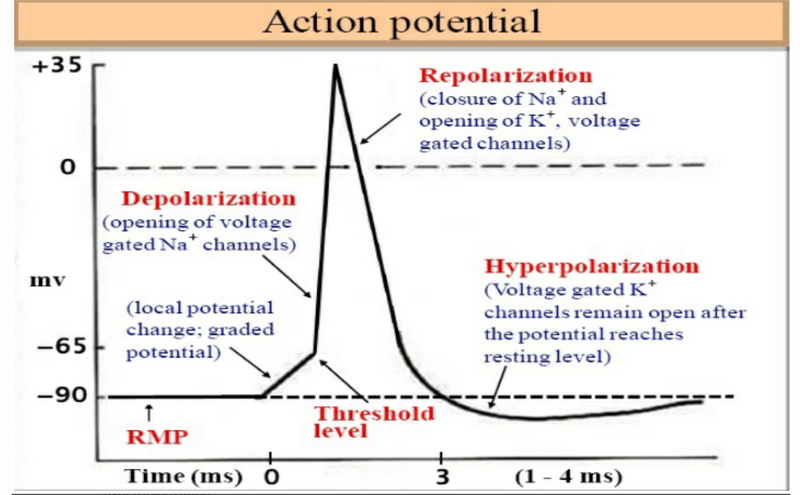 -Opening of Na+ channels leads to opening of more and more of Na+ channels, this increase in of Na+ conductance is accompanied by Na+ influx, which causes depolarization and moves the MP towards equilibrium potential of Na+(+60 mV). 1- Inactivation and closure of Na+ channels which occur soon and automatically after their opening. 3- The direction of electrical gradient for Na+ is reversed because membrane potential is reversed and this limits Na+ influx. 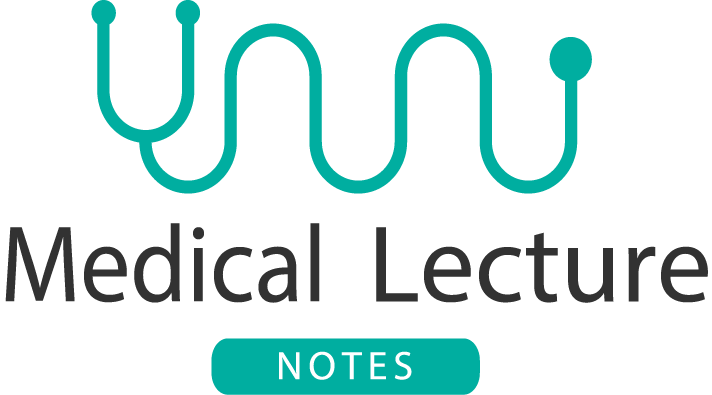 >> During depolarization and for a short period following it, the nerve cannot be excited by even the strongest stimulus. This is called the absolute refractory period ARP. >> A second stimulus given in early part of the ARP cannot produce a second AP over the first one because Na+ channels are already maximally open and cannot be opened further. >> Similarly, if given in the later part of ARP, a second stimulus cannot produce a second AP because Na+ channels are now in the inactivation phase and cannot be opened. >> The ARP is followed by relative by the relative refractory period RRP, which covers repolarization and hyperpolarization. >> During the RRP, an AP of a lower amplitude than normal can be elicited, but only by a stimulus stronger than the threshold stimulus -suprathreshold stimulus. The action potential is not graded but obeys the all-or-none law. This means that a given stimulus either elicits no AP or produce a full AP whose amplitude cannot be increase by further increase in the stimulus intensity.